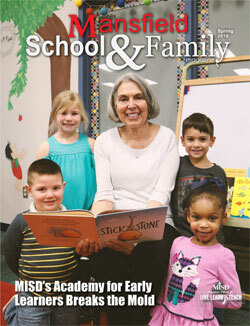 The latest edition of Mansfield ISD’s magazine is now available! In the spring 2018 issue, readers will learn more about the new Dr. Sarah Jandrucko Academy for Early Learners, which is scheduled to open in 2019. Other features include the MISD students from various organizations who qualified and/or won state competitions. Also, view the many pictures highlighting the accomplishments of students and staff from different grade levels.